The Internet is just as good as church when you're hunting for a spouse, according to Wired magazine (May 2008). Seventeen percent of online daters have turned virtual romance into marriage or long-term relationships. That's 3 million people - the same number who've met in church. Stash a few fortune cookie papers in your wallet. When you see a cute guy, cross out the lucky numbers on the back, write your digits, and slip it into his hand with a sly smile. Couples across the country are invited to participate in MY M&M's Milk Chocolate Candies Treasured Moments Challenge to take a vow of silence for a month, sharing their feelings only through M&Ms. (They should have partnered up with Jenny Craig and let the couple lose weight together the next month, because I can't control myself when M&Ms of any kind are around!) The couple selected will begin their vow of silence on June 26. During the month of silence, you can log on to www.mymms.com/win to view footage of the couple (not talking...it should be riveting footage). ;) Full contest information is here. (Click on the Treasured Moments Challenge to enter.) Submissions will be accepted via the Web and snail mail until June 8. Give a dead marriage its proper, final resting place. 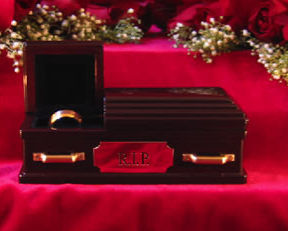 The Wedding Ring Coffin is the perfect gift for yourself or a loved one for bringing closure after a divorce. Standard or custom-engraved plaques on coffin. Bury the past and move on to a new tomorrow. How many times have you wished that men came with a manual? No more. 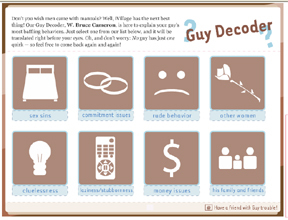 W. Bruce Cameron, author of How to Remodel a Man, is now the iVillage Guy Decoder! Check out his new tool for all the answers to your burning questions about baffling male behavior.